Indirect Participants within the Great Imaginary Conversation across the ages: Husserl, Petrarch, Descartes, Levinas, Shoshami, Wiesel, Kierkegaard, Hegel, Heidegger, Derrida, Vico, Plato, Novalis, Mamonides, Paul, Lang, Kant, Dante, Rosenweig, Rilke, Eliot, Pascal, Joyce, Mann, Rousseau, Francis, Kabir, Averroes, Frost. In this July issue of the Ovi Symposium we have three presentations to offer. The first two, one by Dr. Paparella and the other by Dr. Rahman deal with the problematic of ethics in modern time or the problem of the authenticity of the self as distinguished from the Cartesian ego. For me personally this is a revisiting of one of my very first contributions to the magazine some 10 years ago concerning the role of the modern philosopher Emmanuel Levinas in challenging the millenial Western Ethical tradition. I still remember the editor in chief Thanos Kalamidas informing me at the time, when the magazine was only two years old, that the article had been very well received by the readership. I was of course glad to have made a modest contribution to the publication, for Levinas was and remains one of my favorite philosophers; somebody I’ve always wished to share with as many readers as possible. I trust it will be received with the same enthusiasm as the first time around. As a follow-up the second presentation is a reflection on modern ethics via the work of Charles Taylor. It is also a critique, one can even say a Moslem critique of Charles Taylor assumptions, just as Levinas’ is a critique of the millennial Western tradition on Ethics. Some may argue that the two essays are an exercise into the realm of ideas and extreme abstractions unrelated to the real workaday world in which most people live, the very trap which they warn the readers about. They may have a point in so arguing but it would not be fair given that what is being searched is the authentic language of the authentic self. In any case, in order to retain the character of a dialogic symposium, across space but also across time, and mitigate the danger of falling in such a trap, I have supplemented the two preliminary presentations with a colloquial, imaginary conversation at a café in modern Athens between Plato and Levinas, on the issue of universal ethics. More than a critique, the imaginary dialogue is meant as a brief assessment of two thousand plus years of ethical tradition in the West, beginning with Plato’s Republic all the way to Levinas’ timely challenge to that tradition in order for the dialogue to go forward. I am confident that readers will not be disappointed in the three presentations we have prepared for them in July 2017. They contribute to the ongoing dialogue between the Judeo-Christian, the classical Greek, and the Moslem point of view. Second Presentation: “On Charles Taylor’s “Languages of Personal Resonances” and the Continuing Search for the Authentic Self.” By Azly Rahman. A few background biographical details may be useful to better understand Lévinas. He was born in Lithuania in 1902. In 1923 he moves to Strasbourg to study under Husserl and writes a doctoral dissertation on his philosophy. There, he also comes in contact with Heidegger’s philosophy. The dissertation on Husserl’s phenomenology gets published in France in 1930 and reveals that, even at this early stage, Lévinas is beginning to take his distance from Heidegger. He enlisted in the French army, was captured in 1940 and spent the remaining five years of the war in two prisoner-of-war camps. Upon being liberated he returns to Lithuania and finds-out that his parents and siblings had been killed by the Nazis, while his wife, whom he had left behind in Paris, had survived thanks to the help of French nuns who hid her. He became a teacher and administrator in an institute for Jewish education in Paris (l’alliance Uneversel Juif); there he begins to study traditional Jewish texts under the directorship of the Talmudic sage Mordechai Shoshani to whom Elie Wiesel (who also studied with him) devotes a chapter in Legends of Our Time. In 1961 Lévinas defends the first of his two major philosophical works (Totality and Infinity) before the philosophy faculty of the Sorbonne becoming a professor of philosophy. His second major work bears the title of Otherwise than Being or Beyond Essence. Those are the basic events that dramatically change Lèvinas’ thinking. Prior to World War II, he had merely criticized elements of 20th century Western thought; afterward he begins to attack the whole European philosophical tradition, especially its culmination in Heidegger’s thought, for what he considers its indifference to the ethical and its “totalizing of the other.” He begins to indict western philosophers in general for an uncritical reliance on vast concepts, such as Hegel’s “Spirit,” or Heidegger’s “Being,” which assimilate countless individuals to rational processes, thus negating their individuality. To be sure, Kierkegaard had also criticized this Hegelian tendency, countering it with his existentialist philosophy. Those who understood his critique only too well, promptly proceeded to relegate his thought to the theological within a false dichotomy of philosophy/theology (shown absurd by Thomas Aquinas way back in the 13th century). This insured that Kierkegaard would never be as influential as a Hegel or a Heidegger. In any case, Lévinas too argues that this taken-for-granted totalizing mode of doing philosophy in the West denies the face-to-face reality in which we—philosophers included—interact with persons different from ourselves. He argues that this “face-to-face” realm is not the same thing as the realm of abstract concepts. It possesses its own texture which is primarily an ethical one. In this domain we are challenged by “the otherness of the other person.” It is this “otherness,” which is an integral characteristic of human life, that the Western philosophical tradition has overlooked and even negated, thus contributing to the dehumanization of Man. Lévinas' writings provide no extensive discussion of the Holocaust itself; therefore, the assumption on the part of those who were thinking and writing on it, has often been that Lévinas could not be considered a valid source of philosophical insight into this dark period of human history. But that is an erroneous assumption, just as invalid as the assumption that he unreservedly admired Heidegger's philosophy because he happened to have translated it into French. As a matter of fact, Lévinas' thinking is a reaction to the Holocaust by the mere fact that it asks the crucial question: What does it mean to be a human being? Were one to encapsulate the whole of Lévinas' philosophy in two succinct words, they would be "being human." This philosophy insists throughout that an extreme, unbalanced rationality devoid of imagination, feelings, senses and spirit, unconcerned with the ethical dimensions of life, is the equivalent to a refusal to be human, to allowing oneself to become a monster. A little personal anecdote may be illustrative here: many years ago I took a course on Heidegger with a professor who was a staunch admirer of Heidegger's philosophy. The students were made to read Being and Time on which the professor in question would offer in class brilliant comments and interpretations. Not once during the entire duration of the course was it ever mentioned that Heidegger, for a short while, had joined the Nazi party and had heard echoes of "the voice of Being" in the speeches of Hitler; somehow that particular existential detail was not considered essential by the professor for any valid appraisal of the ponderous rational scheme of Being and Time. I wrote a paper where this existential fact was mentioned and reflected upon. I received a C- for it. The comments of the professor chided me for straying from the concerns of Heidegger's philosophy which had nothing to do with his private life and beliefs. In hindsight, that academic event of my life proved to be my first serious existential encounter with modern Western rationalism and its dichotomy intellect/life. It eventually led me to discover Vico and Lévinas. Indeed this ethical capacity seems to come from another place than our rational powers of analysis evidenced within the Cartesian ego. Even if we grant that such an ego is adequate in identifying the truths of philosophy, it somehow remains unable to acknowledge a domain where there is no choosing of the connection with the other. In fact, the other way around may apply: the other chooses me. One is "already responsible" for the other prior to any rational analysis. And here is the philosophical paradox: Lévinas' task becomes that of using rationality to take the Cartesian ego beyond rationality, somewhat similar to what Vico does with his concepts of fantasia, the poetical which for him precedes rational reason, and the concept of Providence who guides human events and is both immanent within history but also transcendent to it. Which is to say, the rational ego has to be brought to recognize a sort of enigmatic "ethical" truth which Lévinas calls "pre-originary," i.e., arising outside, prior to the usual time-line of the reflective ego. In mytho-poetic language, it’s as if Lévinas were to come face-to-face with the goddess Europa, as she is being abducted by a bull (Zeus in disguise), to journey to another shore, there to assume a different persona, and he were to ask her, “Europa quo vadis?” after warning her to remember her original identity: “nosce te ipsum”; which is to say, go back to the future and know yourself holistically: Know your Greco-Roman origins, yes, but also know the Biblical tradition (the foundation for Christianity), the Christian heritage, the Humanistic synthesis of Graeco-Roman and Christian civilizations, Celtic and Germanic cultures with their ideas of freedom, the universalizing Enlightenment rooted in the democratic-scientific tradition born in ancient Greece, and the Islamic influences. Voltaire and Descartes yes, but Vico and Novalis too are part of your identity. Your unity will be a chimera if it is only a unity of a bank and neglects its spiritual elements. Undoubtedly this hermeneutics, or re-interpretation of the Cartesian ego, placing at its core an non-refusable responsibility for the other without granting the ego any time to think it over and choose, so to speak, challenges some of the most basic assumptions of modern, and in some way classical, rationalistic philosophy. Not since the times of Mamonides in the 13th century had a Jew dared such a fundamental challenge from within the Western philosophical tradition. It is the challenge of Paul to Greek culture revisited. For indeed Lévinas is saying nothing short of this: the knowing ego does not exhaust what it means to be human. Some have called his philosophy one of “ethical subjectivity,” as a way of dismissing it as the raving of a lunatic, just as the ancient Greeks dismissed Paul in the agora. For the serious reader, however, it is rather a re-definition of subjectivity face to face with a totalizing kind of Cartesian reflection. While Lévinas does not write directly about the Holocaust, other thinkers, who influenced Lévinas, were nevertheless reflecting upon the philosophical implications of this dark event of human history. One such was Berel Lang who wrote an essay titled “Genocide and Kant’s Enlightenment,” which appeared in his Act and Idea in the Nazi Genocide. In this essay Lang uncovers certain lines of affinity between some classical aspects of Enlightenment thought and the Nazi genocide. His conclusion is that there are two important aspects of the Enlightenment that formed the intellectual heritage, which needed to be in place for genocide to occur in the heart of civilized Europe: namely, the universalization of rational ideals and the redefinition of the individual human being in terms of its possessing or not possessing such a universal rationality. The genocide, Lang argues, was aimed at those groups who stuck to their own ancient pre-Enlightenment sources of particularistic identity, considered “irrational.” Hence the racial laws and racial exclusion were an expression of ingrained Enlightenment prejudices. Which is to say, the Enlightenment sheds light on everything except itself; it remains to be enlightened. This powerful essay leads many cultural anthropologists comparing civilizations, to begin to wonder: Which, in the final analysis, is more obscurantist: religious fanaticism and fundamentalism, or a so called “enlightened” era that throws out the window the baby with the bathwater and arrogantly refuses any suggestion that it ought to enlighten itself, and not with its own light? This conjures up that terrible face to face encounter of Dante with the poet Bertrand Del Bornio in a cave in hell doing “light to himself” with its own decapitated head. There we have reason eating its own tail; internal logical thinking and assuming the grammar of lunacy. I dare say that such a question has not been satisfactorily answered yet. In that question lies the challenge of Lévinas’ philosophy: in its displacing of the centrality of Cartesian thinking within modernity in order to re-center it around ethics (the face-to-face encounter with another human being which is always hopeful—unless it occurs in hell). Everything we have discussed above begs this particular question: Is Lévinas’ challenge to the Western philosophical tradition philosophically tenable? 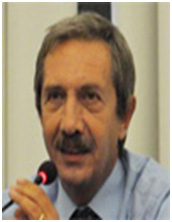 To answer the question adequately we need to be first aware that Emmanuel Lévinas, as well as Hermann Cohen and Franz Rosenweig (the author of Echoes from the Holocaust: Philosophical Reflections in a Dark Time, 1988), are representative of learned European Jews with great familiarity with the texts of both the Jewish and the Western philosophical tradition. They challenge the latter exactly because they are so knowledgeable in both. Lévinas is fully capable of confronting the intellectual traps of those rationalists who would relegate him to the sphere of theology. To the contrary, he insisted on writing in both spheres and claimed that Jewish religious textuality contains hitherto unexplored philosophical insights. For this is a tradition which puts great emphasis on interpersonal, social and familial relationships; phenomena not contemplated in traditional Western philosophy. Which is to say, the challenge is to Western philosophy’s totalizing pretense, beginning with Plato, that it can gather everything up in one synchronic whole. It is that challenge that irritates control freaks, thought policemen, rationalists and mysologists galore. It goes a long way in explaining their attempt to relegate Lévinas’ philosophy to the sphere of the merely mystical. Indeed, this is a new, essentially Jewish, philosophical reflection which places into question the claim to totalizing completeness, by an appeal to the priority of ethics. It insists that any person that confronts me needs to be placed outside the totalizing categories seeking to reduce her/him to an aspect of a rational system. Basically, what Lévinas is doing is relocating our dangerous ability to deny others their legitimate sphere of difference; an ability which is capable of destroying our own humanity. In Charles Taylor’s Ethics of Authenticity (Harvard University Press, Cambridge, Massachusetts, 1991), the philosopher first outlined the predicament of the individual in this age of modernity and offers a moral approach for one to take in order to alleviate the potential of being further eroded by the malaises of negative individualism, overwhelmed instrumental reason, and loss of freedom. For Taylor, the potential remedy of one’s morality and positive individualism being debased, narrowed, and flattened lies in one’s search for the voice within which can be a guide; one which will play a central role in responding to the claims of Nature and the world. Particularly thematic for this brief essay will be Taylor’s idea of the “language of personal resonance” which can play this role. Drawing from this notion of personal language then, I shall elaborate what Taylor mean be it and offer a critical perspective or what seems to be lacking in Taylor’s discussion on the meaning of authenticity. For Taylor the “subjectivized” self is one whose sense of individuality and moral ethos is no longer of referential to an objectified, authoritative sense of morality. It is rather based upon freedom of choice, which has historically been structured by our own insistence on relativizing values and those which have blurred the sense of external reality which ought to guide our moral conduct. This freedom of choice, a negative individualism in character is one which gives prominence of the self rather than the Self, Reason over the Divine, and the private over public. In the language of postmodernity, subalternity and sub narratives reign over universality and grand narratives as domains out of which morality and authenticity can possibility be achieved in one’s lifetime. The subjectivized self for Taylor has been allured away from objective truth by way of confusion which arose out of our misinterpretation of the manner by which the matter of our action is to constitute. (p. 82). The catastrophe which lie in this confusing of the manner and matter of action, Taylor claim, lies in the ability of the self to journey through the path of authenticity. Only through one’s realization that authenticity can be derived as a content of artful and thoughtful living through one’s retrieving of moral ideals that this slide towards the debased form of subjectivism can be avoided and hence make us more responsive to the claims of nature and the world. The language of authenticity lies not in boosting or knocking off modernity, and not in finding a middling ground for both but rather in realizing the centrality of one’s “languages of personal resonance” (p. 90). Through these languages one can then uphold the center and place it to its once pre-eminence position thereby preventing authenticity from becoming the periphery. Thus, Taylor’s concern can be interpreted as his fear of a claim of victory by the postmodernists that the center can no longer hold and that the self is free at last from the “iron cage” of external moral sources derived from religion and other forms of organized body of knowledge based upon universal claims of truth. Taking Taylor’s argument further that confusing matter and manner of subjectivation, he believes that particularly as it relates to the search for authenticity, “[a] great deal of modern art just turns on human powers and feelings” (p. 89). Because there is now erosion of the availability of “publicly available reference points” particularly in literature and in art, he believes that we no longer can articulate something beyond the self. The subjectivation of manner, in the way objective truth is derived, in his argument is so pervasive that much of what the modern human creative act attempts to articulate hover within the arena of language of personal dimension. The atomization of the sense of grasping the meaning in art work within the context of a higher order has been essentially lost although Taylor does admit that some major artists of this century do attempt to articulate non-subjectivist languages of personal resonance. Taylor notes that some of the very greatest of twentieth century writers are not subjectivist in this sense. Their agenda is not the self, but something beyond. Rilke, Eliot, Pound, Joyce, Mann, and others are among them. Their example shows that the inescapable rooting of poetic language in personal sensibility doesn’t have to that the poet no longer explores an order beyond the self. (p. 81) By involving the names of such artistic and literary giants and relating their work to their articulation for something beyond the self, Taylor subtly situates particular artists of the Futurist movement as those who have been trapped in the iron cage of the subjectivation of both manner and matter. Having set forth Taylor’s assertion that the two forms of subjectivation – of manner and matter of action – can be ill – referential in nature and that a legitimate path to an articulate form of rationality lies in one’s rediscovery of the languages of personal resonance, I shall now offer a critical reflection of Taylor’s central thesis. An admirable dimension of Taylor’s work lies in his powerful self is subjected to and in his insistence that authenticity can be retrieved through one’s search for the voice within. To me, modernization, at least insofar as Taylor’s work addresses, has shaped the modern psyche into one having a blind faith in technology, believing in technological determinism as a god of progress and into being drowned by the call of professionalism with all its attendant philosophical underpinnings of utilitarianism and social Darwinism. I value Taylor’s insistence that authenticity must lie not in the trivialized view of its ethics and not to be situated in its meaning of existence within the chaos and complexity of modernity, not in a compromise between what the “boosters” and the “knockers” believe but essentially in one’s finding of the voice within. But then, what is authenticity, in its most objective sense? Wherein lies the languages of personal resonance” Taylor talked about? And if authenticity must exist, what ethnicity might it be housed in? Though forceful in his call for one to retrieve authenticity, Taylor seems to be circumnavigatory in his arguments. On the one hand, he mentioned a great deal throughout terms painting towards authenticity – terms such as “horizons of significance,” “external reality,” “ideal” and “language of personal resonance” – but leaves these terms to be defined by the self without clearly stating what authenticity must look like. If the self is to seek “authenticity” what then should await us at the end of the journey? Is it one whose tenets are defined by “organized and revealed” religion such as Christianity, Judaism, or Islam? Or should they be ones based upon Plato’s “Theory of Forms,” Nicomachean ethics, Buddha’s Eightfold Path, Hindu Sutras or any others conjured by so-called evolved religion? Taylor is vague in outlining this matter of action, although allusions to angels and notion of “The Great Chain of Being” are made. Through critical in his analysis of what poets particularly the post-Romantics have contributed to the subjectivation of authenticity, Taylor failed to do justice to the manner the Romantic era has contributed to our understanding of the metaphysical and mystical self; one which has enriched our understanding of the subjective human experience in order to continue our journey to objectivity and authenticity. … some of the important issues of our time, concerning love and our place in the natural order, need to be explored in such language of personal resonance. To take a salient point, just because we no longer believe in the doctrines of the Great Chain of Being, we don’t need to see ourselves as set in a universe that we can simply consider as a source of raw materials for our projects. We may still need to see ourselves as part of our longer order that can make claims on us. Whilst Taylor might be correct in stating that the modern artist who speaks the language of anthropocentricity is lacking in his/her sense of authenticity, he is not convincing in his explanation of the difference between the objectivity the anthropocentrist attempts to struggle for and the subjectivity (which is in fact) inherent in his “languages of personal resonance.” Whilst I am not claiming that Taylor is incoherent in what constitutes authenticity, the philosopher himself seem to have offered a blurry sense of what authenticity could be. With regard to the modern artist, would it not be fair to also state that the raw materials used for their projects are but means to situate his/her creative word, unconsciously or otherwise, within the demands made by our larger order – that which calls upon human beings to use his/her creative energy, power and vision to understand what lies beyond the self-referential self? Would this not make the modern artist’s demonstration of authenticity similar to the Romantic poet’s sentimental connection to Nature? What then, it entails, is the difference if any between human nature and Nature itself as Taylor reformed to? Did not for example Rousseau mean Nature in a similar sense to those referred to by those such as St. Francis of Assisi, Kabir, Averroes and those attempting to explain what “God” is as a metaphysical concept? I thus find Taylor’s failure to provide a clear explanation of “the ethic of authenticity” as a delimiting factor contributing to weak suggestion of what constitute a moral solution to the malaises of modernity. Rather than engage in a tedious philosophical discourse on what constitutes authenticity and how the languages of personal resonance can help link us with Nature, Taylor could have been more direct by first defining how one is situated in the Great Chain of Being with all his/her attendant relationship with God and the angels and next explain how philosophy can provide a breeding ground for a theosophical outlook for one’s returning to God and the Angels. Taylor could then perhaps define what God means and how modernity has eroded, debased, flattened and narrow our concept of the self in search for the Ultimate Self. Instead Taylor chose to overuse the term “authenticity” and took the risk of being linguistically scrutinized by the subjectivity of the term itself. Perhaps the problematic spin in the discourse Taylor has offered lies in the semantic nature of any term - be they “God,” “Nature,” “Self,” “resonance,” etc. – which can inevitably fall into the trap of subjectivation! My own experience in making sense of this physical world and conscientizing myself to the malaises of modernity has taught me to look at authenticity in a theosophical dimension. Being born a Muslim I am blessed me with the challenge of searching the meaning of the word “God,” and of understanding where Angels reside and where Evil dwells – without losing faith in the power of subjectivism and what self-referential language can offer. I am authentic not only because I attempt to subjectivize Phenomena, subvert external reality, challenge ideals and question authority but also define God in a sense the God is closer to me than my jugular vein. The physical world I inhabit – Nature as it unfolds – is the raw material I use as an artist to define the language of my resonance which in turn connect me to another understanding of what God means of which this understanding keeps on shifting – never the same from when it was last conceived. Whilst Taylor stops at “authenticity” as a goal of one’s existence, I take it as a perpetual point of reference to define my beingness and becoming ness. Within me lie the horizons of significance to be explored, like veils of ignorance to be lifted, like a rustic mirror to be shined until the self within can be seen; the self in it created in the image of the self outside. I am thus both subject and object, subjectivized in an objective self of which the One in me is many and the many One. I am essentially a horizon of which the outside and the inside unite! Having briefly discussed Taylor’s main assertion particularly in Chapter VII are over need to come to terms with the subjectivation of matter and manner and having provided a critique of his lack of clear explanation of what constitute an “authentic self,” and finally relate to those two dimensions of this brief essay to my belief what the subjective and objective self can entail, I end with the following paragraphs on the value of the author’s idea. Taylor’s The Ethics of Authenticity is in general, a lucid, powerful, and enlightening explication and assertion of what the individual in this modern and postmodernizing society can reflect upon. Embedded in the philosophical discourse on authenticity as a point of personal and spiritual reference is the idea that the predicament we are in – modernity – is not entirely an iron cage but one which is a challenge to harness our moral strength so that our struggle to be and become moral beings can continue. The lotta continua, the slogan for continuing the struggle, ought to make us collectively transform this age from one of marginalization paving way for the creation of a genuinely free society. [m]odernity is characterized by grandeur as well as by misère. Only a view that embraces both can give us the undistorted insight into our era that we need to rise to its greatest challenge. And indeed, for Taylor authenticity is not a forking path – neither that of the boosters nor the knockers of modernity – rather, one of a different route. Or in the words with apologies to the poet Robert Frost, it is the road not taken, glad that it was taken… for it will make a difference! Plato: Good evening Professor Levinas. How is your teaching of philosophy in French universities going? Levinas: As well as it could be expected, thank you Plato; may I sit here at this café in Athens and join you for a cup of coffee, if you don’t mind? P. By all means professor. L. To pursue your question, having founded and managed the Academy in ancient Athens, you are of course well familiar with the satisfactions and the frustrations of imparting philosophy to young minds. P. Indeed, academies and universities come and go but some may last for centuries. Although mine lasted a thousand years, we mortal teachers have only a few years at our disposal to leave a permanent impression on the young. We leave them with an inkling, an imprint, a spark that will lit the torch of curiosity and knowledge in them and then just hope for the best. L. You left quite an imprint on them, no doubt, Plato. As you know the etymology of the word “teacher” in Romance languages like Italian and French is “the one who leaves a sign or a mark.” You have left a mark on Western Civilization as we know it and for this we are and remain ever grateful. L. Indeed, Plato, that’s what a good doctor does: he removes the disease affecting the well-being of the whole organism, even when the removal causes temporary discomfort and even pain. It is a necessary pain. Except of course when the doctor has psycho-sadistic tendencies and enjoys inflicting pain for its own sake ignoring the goal which is healing and well-being. There was one such not too long ago, a Nazi doctor by the name of Mengele. He was a competent doctor all right but he was also an abominable human being. He ignored the Hippocratic oath he took not to do any harm. He was more interested in scientific research and advancement than in the well-being of his patients. Tell me Plato, wouldn’t it have been better by far for such a man not to have pursued knowledge; to have remained chained in the cave of ignorance rather than acquire great medical knowledge which he then abused? P. Indeed professor, it stands to reason that a mentally deficient Forrest Gump who lives a good life is by far preferable to an evil genius who uses unethical methods to achieve his scientific goals. I see that we have imperceptibly, but perhaps inevitably I suppose, slipped into the realm of ethics which we ancient Greeks introduced into Western intellectual life. L. yes Plato, it is also my favorite philosophical branch and issue. For years I have been investigating this vexing question: were the Greeks on track when they explored the issue of what is human nature, what are its constituent parts, how does man harmonize them so as to live a life worthy of such a nature? In other words, are the question “what does it mean to be human?” and the Socratic injunction “Know Thyself” the overarching paradigm or does it neglect from the beginning something essential? As you know, before the Hellenic tradition, of classical philosophy there was another tradition which I consider originative, a pre-rational philosophy which without denying reason seems to come from a transcendent place. P. I know, I know professor. I have perused all your interesting brilliant works and I must admit that they challenge the whole development of Western Ethics which puts emphasis on Being and Essence. To be sure, that other Jew, Maimonides, also challenged it, and so did Kierkegaard and Nietzsche, but I continue to insist that the uniqueness of Greek philosophy, such as it is, resides in the fact that it begins with and carries on a totalizing absolutistic tendency in its description of reality, while remaining rooted in rationality. P. And what do you suppose, dear professor Levinas, is the most glaring feature that we ancient Greeks, as originators of classical Western philosophy, have somehow neglected, if not outright suppressed? L. Basically this: there is a rich unexplored relationship between the way we are “ex-posed” in ethics, and the life “exposition” we use to analyze and order the world. P. Could you please be a bit more specific? L. Yes, of course Plato. At the outset, it must be pointed out that my philosophy insists throughout that an extreme, unbalanced rationality devoid of imagination, feelings, senses and spirit, unconcerned with the ultimate ethical dimensions of life, is the equivalent to a refusal to be human, to allowing oneself to become a monster. This may sound repugnant to those who have dedicated their lives to the study of ancient philosophy and the elucidation of the “good life” or the life of virtue well lived and well balanced supported by ethical premises (such as “the unexamined life is not worth living”) but it remains relevant in as much as ancient philosophy remains in the realm of theory and ignores what I call “the other” facing me in my everyday life. P. But as Aristotle has well taught us, does not theory come before practice? To begin with the practice may be equivalent to putting the cart before the horse. P. And where do you find such a bridge? L. Somewhat like Kierkegaard, I have criticized the Hegelian tendency in modern Western philosophy, largely derived from Platonic epistemological concepts, and countered it with a more existential view of philosophy. But I have always been careful not to relegate this kind of existential thought to the mere theological issuing in a false dichotomy of philosophy/theology (shown absurd by Thomas Aquinas way back in the 13th century who wrote his Summa not as a theology book as a philosophy book). I have always insisted that the Hegelian taken-for-granted totalizing mode of doing philosophy in the West denies the face-to-face reality in which we—us philosophers included—interact with persons different from ourselves. I have always argued that this “face-to-face” realm is not the same thing as the realm of abstract concepts. It possesses its own texture which is primarily within an ethical dimension. P. I am beginning to see where you’re going with this argument. Proceed please. L. Indeed Plato, I am headed toward the recognition by reason that ethics may be older than philosophy, that it is ingrained in being human, a "first philosophy," on the scene before the arrival of rational philosophical thinking. It is this ancient voice of goodness, a voice often overlooked by rationalist philosophers, powerfully present in Talmudic texts, but strangely silent in the modern Western philosophical tradition. P. I can agree on the neglect of ethical considerations in some modern philosophy, especially that with positivistic scientific approach, but, within purely classical categories, isn’t it equivalent to the Socratic preoccupation with dying well by living a life of integrity and devotion to truth, as exemplified in my The Republic as well as The Apology? L. Undoubtedly this hermeneutics, or re-interpretation of the Cartesian ego, placing at its core an non-refusable responsibility for the other without granting the ego any time to think it over and choose, so to speak, challenges some of the most basic assumptions of modern, and in some way classical, rationalistic philosophy with a penchant for logical sequence and theory arrived at before practice. But I continue to think that it represents a deficiency within Western philosophy. P. Are we not re-inventing the wheel here? Are you saying that intuition is all and that we should disregard reason. Are we proposing the myth without a rational foundation? But there are myths and there are myths or poetical description which are good and some which are nefarious. The myth of the super-race, for example is a myth devoid of logos. L. It does not surprise me a bit Plato that you should find my reasoning jarring to your classical philosophical ears. Indeed, this is a new, essentially Jewish, philosophical reflection which places into question the claim to totalizing completeness, by an appeal to the priority of ethics. It insists that any person that confronts me needs to be placed outside the totalizing categories seeking to reduce her/him to an aspect of a rational system. Basically, what I am proposing is a relocation of our dangerous ability in the West to deny others their legitimate sphere of difference; an ability this which is capable of destroying our own humanity. P. What you call “classical philosophical ears” is in reality the universal voice of reason. Reason is not Jewish, or Western, or Oriental, but universal. Its appeal too is universal. L. I content, on the other hand, that were it so, then ethical distortions would not be tolerated so easily. Take slavery, as an example. Surely, Plato, you’d agree that the universal appeal to universal reason dictates that it is an unethical institution to be abolished from the face of the earth. Yet, it took more than two thousand years since your times, for it to be declared illegal world-wide. In some way it is still around. P. What I am having difficulty wrapping my mind around, professor Levinas, is the idea that the particular (a particular human culture such as Talmudic Jewish culture) leads to the universal. Could you elaborate further please. L. Well, Plato, it may not be comprehensive totalizing rational idea but it certainly is an intuition. The intuition is this: a particular culture may never go beyond its own particularity but the universal, once it is reached, derives from the particular: without individual human beings in existence there is no such thing as human-kind. By itself, human-kind remains an abstraction. Its universality is rooted in its particularity. The universality of human rights resides within each individual. There is no universality without individuality and that is why human rights are inalienable. P. If I understand this correctly, it sounds to me like the logical fallacy, contrary to the principle of non-contradiction, of something that can be and not be at the same time. L. Perhaps it is more a matter of complementarity than of non-contradiction. I submit that the particular Jewish religious textuality contains hitherto unexplored philosophical insights which emphasize the interpersonal, social and familial relationships; the kind of phenomena not contemplated in traditional Western philosophy. Admittedly this is a challenge to Western philosophy’s totalizing pretense, that somehow it can gather everything up in one synchronic whole. P. Would you say, professor, that it is such a challenge that irritates control freaks, thought policemen, rationalists and mysologists galore, those who would like nothing better than to relegate your philosophy to the sphere of the mystical? I must frankly confess that I myself at times find the Talmudic writings bordering on the mystical and the esoteric. L. My philosophy has in some way received the same opposition as Kierkegaard’s philosophy. It has been mistaken for a theology. What irritates rationalists of all stripes is that it is a sort of philosophical paradox: using rationality to take the Cartesian ego beyond rationality, an enigmatic “pre-originary” ethical truth arising outside time and space and prior to the time-line of the reflective ego, somewhat similar to what Vico does with his concepts of fantasia, the poetical, which precedes rational reason, or to Vico’s concept of Providence guiding human events and being both immanent within history but also transcendent to it. P. As you know, at the end of the narration of the myth of the cave in the Republic the question is asked as to how can we be sure that the myth has any kernel of truth since it is narrated by somebody who may still be dwelling in the cave of ignorance. L. And the answer, the only possible answer was “only God knows.” But we still intuit two millennia later that the myth of the cave contains a kernel of truth that is still relevant today for the preservation of our humanity. We intuit it more than we reason to it. P. I must confess professor that this evening you have given me plenty of food for thought. Truly, this conversation has been for me more enjoyable than a game of chess. I need to go home now and reflect upon it, digest it properly, before we resume this interesting dialogue on Ethics in Western philosophy. I believe that you may end up making a great contribution to the field of Ethics. Thank you for your collegial company professor. L. Likewise. Till we meet again my dear friend. 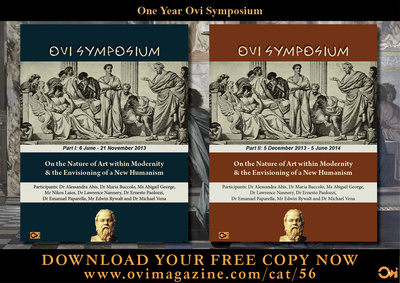 Download for FREE the "Ovi Symposium" Part I & Part II EBooks, HERE!